LNet, a compatible sytem with LocoNet® is popular because of its reliable and easy to use hardware. So far GCA did not have a direct system for controlling servo's. There was the very popular GCA136 unit, easy configurable within Rocrail. To connect it to LNet, there always was needed a GCA50, which could handle two of these units, or one and combined with other units. GCA183 is one step further. GCA183 also provides connection for the relay-unit GCA137, to enable reversing power for frogs in switches. or supply the board with external transformer. The board itself is completely isolated from LNet when the external power supply is selected. For larger setups( i.e. more than 5 of these units in the network), the external supply is preferrable. This board also contains a standard RJ12 LNet connector, to easy adapt to LNet standard. and are under various test situations now. 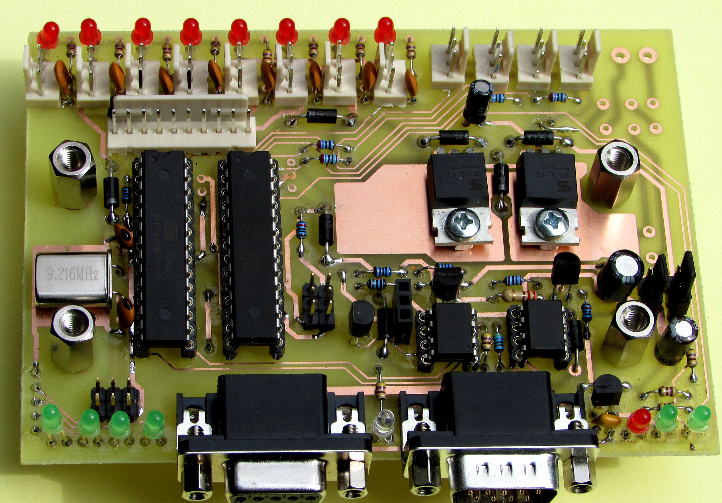 A professioinal produced pc-board and/or kit will only be available after these tests are finished completely and showed to be functional as desired.